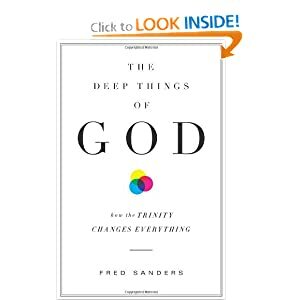 Even the full title of this book jazzes me, The Deep Things of God: how the Trinity Changes Everything by Fred Sanders. This book was one of my favorite Christmas presents. I like it so much I want to share it with everybody who wants a little more philosophical depth to their understanding of the gospel. I've been reading Sanders for years now at the blog, The Scriptorium. He writes well and loves God. I love that this book is a celebration of evangelicals and their trinitarian theology, but he does not need the filoque clause to distinguish the Holy Spirit, so even an Orthodox Christian can enjoy this book. Sanders is not ashamed of his evangelicalism, and he wants evangelicals to not be ashamed. He wants us to know our trinitarian credibility is real, so he limits himself to (almost) only reference Protestants, from Tyndale to Calvin to Wesley to Edwards to Watts and Warfield and a bunch of people I never heard of. I'm really glad to meet some of these people in my religious heritage, like F.B. Meyer. Although Sanders quotes the Bible too, this is not the book for your debates with Jehovah Witnesses and Unitarians. He refers us to works oriented that way, such as R.A. Torrey's book, What the Bible Teaches, especially about the deity of the Holy Spirit. This is more of a philosophical defense. But the church needs more than the three states of water analogy to help us understand the concept of the Trinity and it's implications. A correct understanding of the Trinity keeps our gospel from being too small. Sanders also does not mind those voices who have an experience with God. Sanders had to end the book someplace. There is so much more to be said. It doesn't feel finished, just stopped. Sanders tells us in a recent blog post, that he knows there is more to understand and apply and he is writing on those things. I'd be more than happy if he only wrote books on the Trinity from here on out. Get the book and think on these things. I'm giving away a prize!!! !